Your obsession in full color, to enjoy throughout the year. 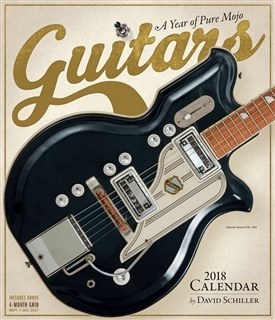 Adapted from the lively and obsessive book 'Guitars' by David Schiller, this calendar spotlights a dozen rare, revolutionary and showstopping instruments in sensational full color. Every month, Guitars shines the spotlight on a unique, historic, or groundbreaking instrument with a full-color photograph, beautifully showcased by the calendar’s custom vertical format. Accompanying the images is fascinating text exploring the guitar’s history, makers, players, musical styles, and milestone moments. Destined to get guitar lovers jonesing for a luscious new axe of their own! The 2018 Guitars calendar measures 12" x 28" open. Add the book on which it's based, 'Guitars-500 of the World's Most Seductive Instruments' to make a great gift set. Includes a bonus 4-month grid; Sept. to Dec. 2017.